Popular Trigger Shifter features a round chrome shaft with a sliding "Trigger" to release reverse lock-out. A great looking shifter that will dress up your interior. Polished aluminum shifter. T-Handle with a push button to release reverse lock-out. A great looking shifter that will dress up your interior. Replace your stock worn shifter with a brand new one. This is a replacement stock shifter for your '67 & earlier Bug or Ghia. It can also be used to replace the shifter on a later model if you'd like to move your shifter knob closer to the driver. Does your stock shifter have more throw than you'd like? Feel sloppy? Install this quick shift kit underneath the stock shifter and shorten the shift throw. This is the shift coupler that connects thr shift rod to the "hockey stick" on your transaxle. If it is worn, it can cause very sloppy shifting. This is the stock unit. For an even better and more durable design, use our Heavy Duty model. Is your shifter super sloppy in your bus? 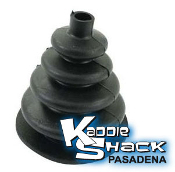 Chances are, one or more of your shifter bushings are worn out. This is a simple kit and fairly easy to install. 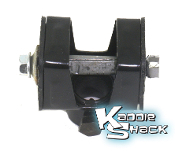 It replaces all of the bushings that tend to wear out in the shift linkage of the bus. This is the bracket that is spot welded to the tunnel under your shifter that holds your shift rod bushing. If your shift rod bushing has been worn out too long, it can cause the hole in this bracket to oval out. When this happens, there's no real fix, other than to replace the bracket. 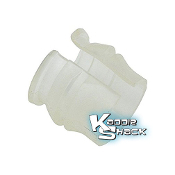 Replacement boot for your stock or aftermarket shifter.